There must be tens of thousands Calibre records been made all over the world. In the 60’s and 70’ they had little booths in every big city in Europe, especially at locations where tourists came. But I have never read an article about these one-of-one recordings, nor have I ever seen a picture of a Calibre auto recording booth. 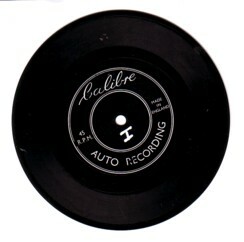 The records are all identical: 6 inch slabs of hard black plastic with on the center in white letters the text “ Calibre Auto Recording, 45r.p.m., Made in England ”. Recently I found two Calibre records, made by two Dutch guys in London. On the first record they tell that they are in London to see bands and to find women. On the second one they tell that they had a great time. That makes me wonder where the rest of the records went, on which they tell all the details. But they also describe the recording booth that they are using and how it works. That’s enough to make me happy. I just love the idea that you can record records in a little booth for a few shilling. Eh, could ! I wish this possibility was still available today! The sound quality of these two recent found Calibre Auto Recordings is bad and the two men speak Dutch, so I decided to pick another Calibre record from my collection for today’s soundtrack. It is stuff like this that made me interested in this whole phenomenon of one-of-one records. Thanks for the link. Nice story! I have about four or five Calibre records, and just to inform You: One of them is 7”. Never saw another one, but nevertheless they exist. I recorded my first (and only) record in Bournemouth (England)on the boulevard near the beach. It was stupid not to make a photo of that booth! I am so sorry now. I talked, sung and made jokes, while my girlfiend waited outside. At the moment I cannot find this record, but I still have it. It must be Calibre. I can’t remember having seen those machines somewhere else…. comment 3024 you told me. Me and a mate, after lots of Cider, entered one of these booths in Butlin’s @ Skegness (1971). We “sang” a bit and talked rubbish. Listened to it only last week… Rather embarrassing now.